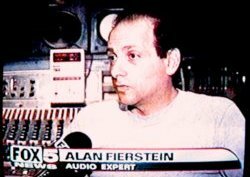 Alan Fierstein has been featured as a noise expert in four recent news segments on the Fox 5 Ten O'clock News in New York City. He also participated in a roundtable discussion regarding Nightclub Safety on the Fox 5 program "Street Talk". 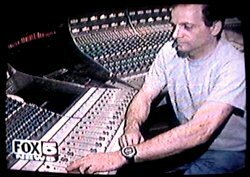 In the most recent segment, Mr. Fierstein was called upon to investigate claims being made for some allegedly high-quality home stereo speakers. Mr. Fierstein was called upon to test some speakers that were being sold as Audiophile Quality. With poor construction, worse sound and comical documentation, they turned out to be anything but. 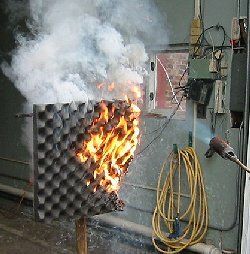 Fire Hazards of "Soundproofing Foams"
In the wake of the tragic fire at a Rhode Island nightclub, Al Fierstein was called upon as an expert on soundproofing materials. See our Fire Safety page for more information. 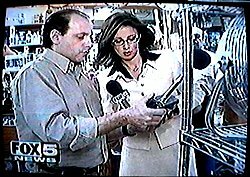 Mr. Fierstein was called upon to measure and compare the noise emitted by different models of fans at a local appliance store. Mr. Fierstein was asked to demonstrate why subway public address announcements are so difficult to understand and describe some possible improvements. Fierstein- "I recommend materials like this, rather than materials like this." 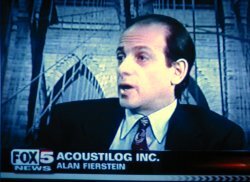 Alan Fierstein is President of Acoustilog; a soundproofing expert. He says using Fiberglass can save lives. Fierstein- "These materials, as I said, are more effective, they're less expensive, and much, much safer in the event of a fire. That's where Alan Fierstein comes in. He's an expert, from Acoustilog. We took him shopping for a cool fan that doesn't make a racket. But be prepared to pay. This is what 30 bucks gets you. Fierstein- "You're getting a rattling unit that's not pushing air so fast, and because the rattling is making its own noise, it's not a good unit for people who want quiet." Alan says the science to keeping cool starts by testing them in the store. Reporter- "How loud is the fan?" Fierstein- "Well, this one is 69 decibels measured 12" in front of the fan. The smaller the fan, the louder it is". Reporter - "Alan Fierstein, a respected acoustical consultant, says part of the problem is the timing of the announcements." Fierstein - "Simple, inexpensive solid state digital modules will delay the sound of the announcement until the train has passed."